Our competition is SnapChat and every other popular messenger app in existence. Our name cannot be changed, and it is not compatible with our target demographic. We have one month to get this done. Oh, by the way, two of those weeks are over xmas holiday. Never one to back away from the right challenge, I accepted. I had the good fortune of not only being available for this project, but to assemble a team of first-rate creative and professional talent to pull this off. The first critical stage of this project was to identify the demographic and then gather as much market data and research as possible in order to define voice and messaging. The name frankly had been chosen prior to our engagement, and was based on how the app allows users to speak frankly due to anonymity (users can choose to be anonymous) and ephemerality (messages disappear in seven seconds). While this worked for the enterprise, the name was not particularly appealing to the iGeneration audience whod never heard of the speak frankly idiom. We chose to soften the name with typography, using a highly customized version of an existing typeface, and going all lower-case to make it more friendly and approachable. A chat bubble was added for reasons which should be obvious. One of the coolest features of the Frankly app is the ability to quickly colorize each message and adjust text size before sending it. This allows users to express tone (whisper or shout), and to emote via color with each message. While the messages are all ephemeral, a chat conversation with varied text sizes and varied message colors can be visually engaging. We leveraged this unique quality to develop the color bands you see in the identity. 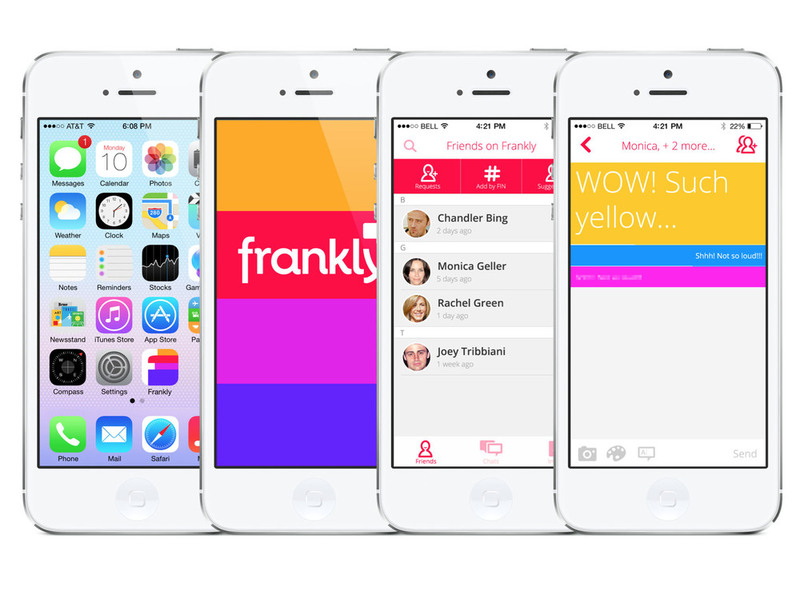 As a messenger app, Frankly is truly a remarkable product. The entire product is well thought out, the features are impressive, and the user experience is extremely delightful. The branding serves the product well, but all of this combined wasn't enough to overcome the massive hurdles we faced from the beginning. Being late to market, going up against extremely well financed competition, and trying to reach an audience with a name that is potentially off-putting to a large percentage of the user base were extreme challenges. While the business put a significant amount of resources into marketing, it was only a fraction of what was needed to succeed. Oh yeah, here's the full branding deck if you're interested.